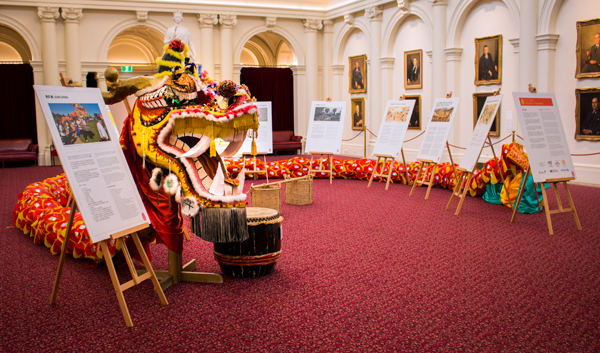 The contribution of Chinese people to the development of Victoria is being recognised in a new exhibition at Parliament House. On show in Queen’s Hall from 19 to 23 September, ‘Chinese Fortunes’ traces the history of Chinese settlers in colonial Victoria between 1851 and 1901, and considers their impact on contemporary Australia. The exhibition is being presented as one of the first events leading up to the 160th anniversary of an 1857 poll tax that was imposed on Chinese settlers arriving to work in the Victorian goldfields. The poll tax forced many settlers to arrive into Robe in South Australia, rather than into Melbourne. They had to trek more than 400 kilometres in order to reach the goldfields. The ‘Chinese Fortunes’ exhibition, in both Mandarin and English, is being presented as a partnership between the Victorian Parliament, the Museum of Australian Democracy at Eureka, the Public Record Office Victoria, and the Golden Dragon Museum in Bendigo. Fortune Dragon Gum Loong is the centrepiece of the exhibition. The dragon was crafted in 1991 by students from Mt Blowhard, Sebastopol and Canadian Lead Primary Schools in Ballarat. The pop-up exhibition at Parliament House is a preview of a larger exhibition to be held at the Museum of Australian Democracy at Eureka in Ballarat next year.